Last week, The Five-Year-Old came home from school with a simply brilliant fundraiser in tow. During art class, The Five-Year-Old and her classmates drew pictures with markers. Each picture was labeled with the child’s name and her classroom information. The school then bundled up all the pictures from every class and mailed them to Square1Art. Square1Art’s sticker fundraiser virtually reproduces each child’s design on a variety of products — ceramic art tiles, wall plaques, luggage tags, notecards, magnets, tote bags, yard flags, t-shirts, pendants, ornaments, and so on — and then markets those personalized products to the parents of the children who made the art. 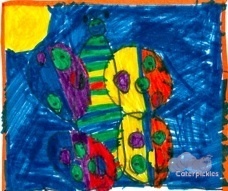 Every child receives a set of stickers made from their art just for participating while parents get a brilliant catalog that showcases their child’s art on Square1Art’s most popular products on its cover. Inside are a variety of other potential applications for your child’s masterpiece, along with instructions for ordering online or through the school. A portion of the proceeds go to support your child’s school, which means I can overlay my inordinate pride over The Five-Year-Old’s artistic skills with a respectable veneer of supporting her education. We contented ourselves with simply ordering a bunch of stuff online. And yes, ordering online was a fairly straightforward process. The Acquisition of the Very Many Beautiful Objects Decorated by The Five-Year-Old is a mild set-back for the Great Decluttering Operation of 2013, but I did try to stick to items that we would actually use. For the most part.